We seen Porsches, and Porsche parts, turned into any number of different items, and more often than not we've liked them. There was the Boxster turned into a Lambo, the 911 stretched into a Limo, the GT3 wing into a shelf, even a 356 beat into a BBQ. 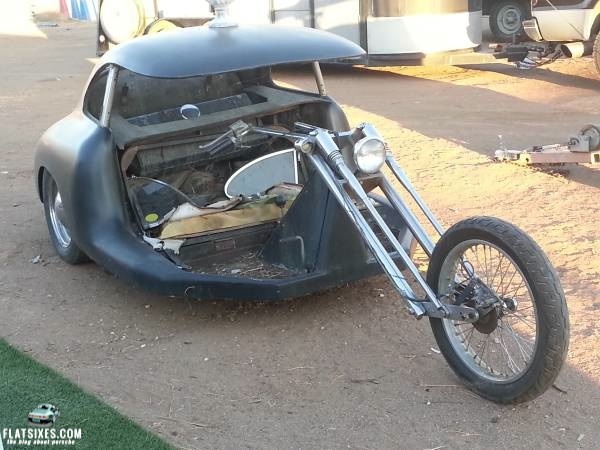 However, this is the first time we've seen someone take what is said to be a "numbers matching" Porsche 356 and convert it into a chopper/trike. This THING is so many flavors of wrong it's really hard to describe. Described as a "wind tunnel design tested", "one-of-a-kind" (we sure as hell hope so), this Porsche come chopper, is said to be once owned by a "legendary motorcycle builder hotrod designer and custom painter" (Von Dutch anyone?). Bring A Trailer showcased this creation yesterday and readers over there are wondering if the Porsche bubble is big enough that someone would buy this to restore it? If the Von Dutch provenance can be documented it might be worth saving. If not, I say kill it with fire! Is This The Worst Spoiler You’ve Ever Seen on a Porsche? Some things should be left undone. This is one. At some price point this hulk will be worth buying for the rear clip and engine/transaxle, if it’s still a Porsche unit. Sometimes there’s just no accounting for taste (sigh). A “numbers matching” 356?? Obviously this person has more money than sense…..bet he drives a ’75 Corvette too (which had only 165 hp…..even less than this monstrosity). It should be preserved as an object lesson, a “teaching moment”, showing the dangers of mixing cheap tequila and a cutting torch…God help us. I think it may have been made to give the bird to all the snobs that think a Porsche should only be driven at weekends under 100mph!!! As a biker and porsche builder I think it’s cool plus if you ever need a rear clip to complete a 356 you have it! I would totally sport that. It would be a daily rider for me just because it is what it is!